Mesotherapy is injection of vitamins, minerals, amino-acids, enzymes, homeopathic drugs into middle layer of the skin as compounds. It is composed of meso (middle) and therapy words in Latin and means “middle skin treatment”. Mesotherapy which had been incidentally discovered by Michel Pistor in 1952 was accepted as a medical treatment method by French Medical Academy in 1987. Mesotherapy which is being applied by approximately 15000 doctors in France is frequently used also in Turkey. Mesotherapy targets direct injection of the drug to the target region. Applying the drug to only problematic regions both increases effectiveness and also minimizes side effects. Mesoderm is the functional layer of the skin and contains a large vessel net. 1 cm2 of skin contains approximately 6 million skin cells, 400 cm nerve fibers, 200 pain points, 100 sweat glands, 1 m vessel, 15 endocrine glands (smell, fat), 5 hair roots, 12 cold perception points and 12 hot perception points. In which conditions is mesotherapy applied successfully? It is widely used in many fields worldwide. The procedure should certainly be applied by the experts. It is applied using very fine needles (4-6-13 mm in height and 27-30 gauge) depending on administration site. The important point is being aware of the pharmacologic features, interactions and side effects of the drugs used in the compound. Is pain felt during the procedure? Most patients do not feel pain. Mesotherapy needle is very fine such as a hair fiber. So the patients do not feel pain. Anesthetic drug may be applied before the procedure if the patient feels pain or discomfort. Who cannot be applied mesotherapy? Mesotherapy does not have a severe side effect. Mild redness may develop at injection site. These effects may be seen less if applied b y an expert. If small swelling or ecchymosis develops, they will recover within a couple of days. Contains Dmae and hyaluronic acid leads firming. It revitalizes eyelids, contains Ruscus, rosemary, vitamin C, hexapeptide and anti-oxidants. It is used for treatment of edema, sagging, wrinkles, infra-orbital rings and lividity. It contains DNA nucleotides, green tea extract, spirulina, hyaluronic acid and used for treatment of skin renewal, repair, photogenic aging, estrogen inadequacy-related skin weakness, stress-related skin tension, oxygen –lacking tired skin, pre and post-menopausal problems-related scar and lesions. It contains N-acetylcysteine (anti-oxidant), hyaluronic acid, idebenone, coenzymes, nucleotides, amino-acids and vitamins and used for proviidng a shiny , moistuirized skin and lifting. It is composed of salicylic acid, azelaic acid, mandelic acid, bisabolol, glycyrrhetic acid. It is a professional cosmetic product used for treatment of acne and requires professional use. It is effective for reducing wrinkles and face-body hypotonus through the synergy of 4 active ingredients. ACETYL HEXAPEPTIDE 8 AND ACETYL HEXAPEPTIDE 20: polypeptide, widely used in cosmetic medicine. It is effective for treatment of and reducing deep wrinkles. DMAE: Stimulant, revitalizing, anti-aging effects. HIBISCUS ESCULENTUS EXTRACT: The Southern America plant which has been known since ancient times is used for rejuvenation, anti-spasmodic and smoothing effects. It is rich from anti-oxidant, proteolytic enzymes and softening substances. GREEN TEA EXTRACT: This well known anti-oxidant mixture is rich from poly-phenols and strengthens skin, fights with free radicals. Tiziano: It is a cocktail composed of omega CTP complex, organic stem cells, resveratrol, copper peptide, collagen, hyaluronic acid, omega 3,6,9 and amino-acids. Aging signs like fine lines, sagging start after 35 years as these substances cannot be produced by the body. It is treated for elimination of fine lines, for lifting, forming in face, neck, decollete, hands, umbilicus, axilla, inner part of thigh, infra-orbital bags. Organic stem cells, resveratrol, copper peptide repair skin, eliminates age-related thinning. Omega 3,6,9 fatty acids and amino-acids provides density. Is Tziano effective on sagging? Omega CTP complex has lifting and enhancement effect. Is it effective on wrinkles? 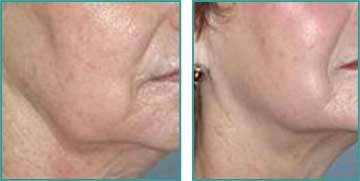 Collagen and hyaluronic acid eliminates wrinkles, lifts and moisturizes skin. In which regions is Tziano used? For infra-orbital bags, face, neck, decollete, hands, umbilicus, thigh. It prevents particularly the sagging which can develop after fat destruction with Michalengelo. How frequently is Tziano used? Every skin type and every region have different needs. Usually maintenance treatment is started following 3-4 sessions within the first month.